I can not seem to get past my thermal runaway issues. I ran a print last night that went up 5% every 3 layers. I got to 60% and had a thermal runaway error. I just replicated Gregg's dual profile settings for a single extruder but the print failed on thermal runaway again. 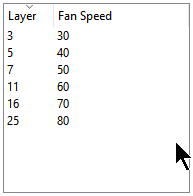 I have tuned the PID and set the fan as low as possible but I still can't get past it. Can someone suggest some settings that might help? Yeah I just tried 30 at layer 3 and it killed it. Its a 350% benchy so it's not small! I tuned the PID at 215 and it was very stable but could not cope with the fans! If you have OctoPrint connected, could you post a graph of your nozzle temperature? Might also be worth posting a picture of the extruder / fan position. When its printing? Capturing a failure? At the beginning of every print, the nozzle comes from cold to temperature. Would be interesting to see that graph. Incidentally, if you watch the LCD and you can see the fans beating the nozzle down, you can go into Control > Temp and turn the fans down before they win. Appreciate that's not going to work long term, but it might help you get something going right now. 100% is probably just not needed. The fans are monsters, possibly overspecced, so I don't think you necessary have a problem if you can't get to 100%. The graphics do look like the PID is tuned well, probably better than mine. So, maybe just don't make such large leaps. For Benchy you really only benefit from any fan at all when the top goes on the boat. At that point, the print bed should be quite a way away and you shouldn't get as much wind reflection from that. There's actually a shape in the fan duct that tries to stop the airflow moving straight over the hot end. Has anything become accidentally lodged in the fan duct, thus altering the flow (clutching at straws here). The cables coming from the front of the heater don't look like they've been bent over as per build manual (again clutching at straws, I'm not sure how that would affect temperature control). Yes the cables are bent, I think it's just the angle as it's taken from the OctoPrint cam. I think you are right little steps are better it's currently happily printing at 50%. Although it was like this last night until the "deck" then it killed it. I have some vibration sounds coming from somewhere around the y Carriage but I have a new X Carriage to drop in so at some point I may thread lock some bits. I will update on the print success later! It's a medium length 10hr print so we will see! It should be noted that the nozzle should be barely below the fans. If the fans are too high they'll get too much airflow on the nozzle and get the thermal runaway. 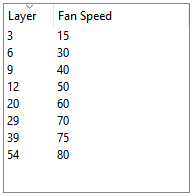 You can also do PID tuning with the fans enabled to help its response times. The downside is you'll probably get bad overshoot and take longer to stabilize. Another thing to take into account is that the printed model has a profile that will affect air flow around the nozzle and may or will deflect upwards. Also, two fans blowing towards each other on the dual setup will create a complex air flow. Laminar flow is a complex science but this is just a "blow-and-hope" setup so we have to make the best of it and adjust accordingly; my preference is to protect the hot end. @mike01hu did he just put a piece of capton tape on the side that faced the fan outlet? That's super easy, and if it makes life better, I'll do that. There was a picture of his printer somewhere on G+ that showed what he had done. It was not related to the issue but someone did pick up on it. I'm sorry I cannot pin it down but I will have another look. My view is that two or three layers would do to ensure thermal conductivity is less and you should get away with covering the one side; do try to wrap the block as this will improve things much more. Found it here but it is on a Volcano. Top left of picture.